Facebook on Thursday released an update to its Instagram apps for iOS and Android, opening up the media-sharing service to posts in landscape and portrait ratios. When choosing an existing photo or video to upload, Instagram users can now tap a format button to choose one of three dimensions. The full-sized content will then appear in feeds, although profile grids will still show images in cropped squares to preserve symmetry. Instagram has traditionally forced users to post all content in a square format, a deliberate throwback to old analog cameras such as Holgas. The update also breaks down barriers between filters. The apps previously maintained separate filters for photos and videos, but these are newly interchangeable. On videos, users can now scale the intensity of effects. 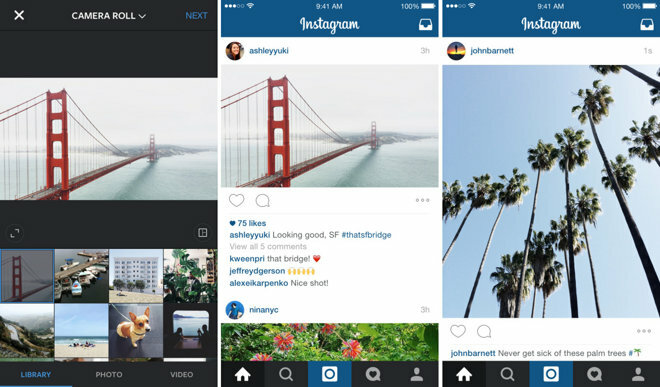 The iOS version of Instagram is a free download, and requires an iPhone or iPod with iOS 7 or later. It also has a companion Apple Watch app that can be used to browse photos or check feed notifications.